Emblem books were a best-selling genre during the sixteenth and seventeenth centuries, in France and throughout western Europe. In the emblematic format, each symbolic illustration is accompanied by a brief title or motto, an edifying verse epigram, and often an additional explanatory text in verse or prose. From these books we can learn much about the cultural values and moral concerns of the reading public in Renaissance France. Furthermore, the woodcut figures, as well as the ornate typographical borders that often framed the illustration or the entire page, provided decorative themes for ornamentation of clothing, jewelry and household furnishings. 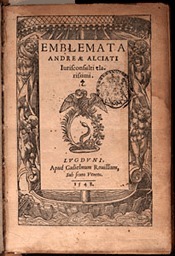 In 1531, an Italian lawyer and scholar, Andrea Alciato, introduced the first book of emblems in Germany. His epigrammatic verses in Latin on moral themes were illustrated with woodcut figures on the initiative of his Augsburg printer. 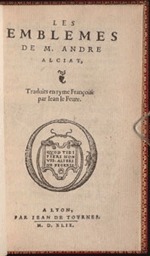 Following Alciato’s example, printers in Paris and Lyon published numerous successful variations on the genre, first in Latin, and then in the vernacular French. Many of the moral themes addressed in the emblems came from classical sources, such as the Greek Anthology and Aesop’s Fables, and from humanist sources, Erasmus’s Adages in particular. Humanist interest in the Egyptian hieroglyphs of Horus Apollo, and the subsequent urge to recreate a pictographic language, directly linking symbol and concept, further fueled the enthusiasm for emblems. 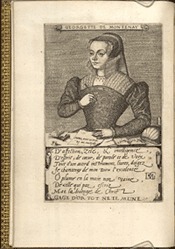 The genre was also adopted for religious ends, in numerous Bibles figurées, and by Georgette de Montenay in her Emblemes et devises chretiennes. In the realm of heraldry, the popular emblem format shaped the published collections of Claude Paradin, whose Devises heroïques represent the individual and courtly form that replaced heraldic blasons in fifteenth- and sixteenth-century France. 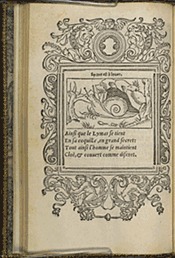 The Gordon Collection includes many beautiful and important examples of the French Emblem book, including those of Alciato (in Latin and in French), Claude Paradin, Guillaume de la Perrière, Gilles Corrozet, Barthélémy Aneau, and numerous works that illustrate Biblical scenes (Holbein, Maraffi, Simeoni) and mythological tales (La Metamorphose d’Ovide figurée) in an epigrammatic format. Also among the treasures of the collection is the Blasons anatomiques of 1543, an extremely rare illustrated edition of emblematic poetry about parts of the female body. Emblem books have drawn much scholarly attention in the past fifteen to twenty years. Excellent studies on the French emblem book in the Renaissance have been published by Daniel Russell, Alison Adams, Alison Saunders, and Stephen Rawles, among others, including the monumental two-volume Bibliography of French Emblem Books by Adams, Rawles and Saunders (Geneva : Droz, 1999). The rise of Cultural Studies and interdisciplinary research have undoubtedly contributed in recent years to the growing scholarly interest in emblem books. The influence of contemporary media culture and modern advertising techniques have also heightened our appreciation of these books that rely on popular iconography of the Renaissance to produce the print version of a “sound bite” or slogans to convey a message. Due certainly in large part to their visual appeal, emblem books are the focus of several groundbreaking digitization projects, notably those under way at Glasgow University, the University of Illinois, Penn State University, and Utrecht University (See below). Digital and Internet technology are proving to be effective tools for reproducing and comparing the many variations on similar themes that recur in the emblem books published throughout Europe in the Renaissance. Glasgow University Emblem website—This site provides an overview of many current projects and includes references to numerous related sites of interest.